P.S. someone should start a Ravel thread on the Composer Discussion board! Hadn't realized it until Guido mentioned it elsewhere on the board but apparently there isn't a Ravel thread! Seems unfair to one of the greats so here it is. In celebration of this inuagural thread, I'll listen to the Sonata for Vn & Vc! Childish to still have such things, perhaps, but Ravel is probably my favourite composer, along with Janacek. (und Chopin ist auch dabei). (und Brahms). As with Janacek threads, I find it hard to put into a couple of succinct paragraphs what his music means to me, so I'll probably step into this thread more if and when it gets going. No Ravel thread? Well, thanks, donwyn, for correcting such a massive omission. 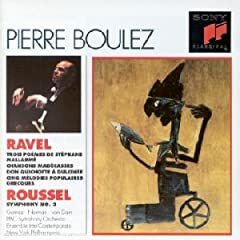 I am a huge Ravel fan, as well, ever since at a very early age I heard Rapsodie espagnole by the Dallas Symphony Orchestra--loved it immediately and never looked back. Too many favorites to list, but I am probably one of the few who still like hearing Boléro played by a great orchestra (e.g., Cleveland did it a few years ago), as a textbook example of brilliant orchestration. And just in the last couple of years I have discovered L'enfant et les sortilèges--what a score that is. Like Luke, I find there is way too much on which to comment, and look forward to others' remarks on Ravel's work. Some of the songs with piano were a recent, sumptuous discovery for me. Oh, yes, little hidden treasures like the Noel des jouets, or the Deux epigrammes de Clement Marot, or above all the Histoires naturelles - Ravel at his very best. 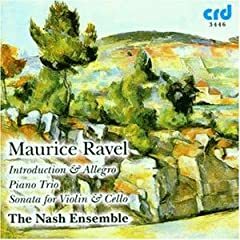 But the core of Ravel songs, for me - in fact, the core of his output - are the two sets of songs with accompaniment by chamber groups: the Mallarme set and the Madagascan one. I understand why Ravel for most people means Bolero and Daphnis - but its these pieces, Gaspard and Miroirs, the later chamber music (piano trio, duo sonata, violin sonata), the two concerti, and L'enfant et les sortileges, which I think are the pinnacle of his music. Though he's one of those composers who has scarcely a duff note, so it's hard to find a work I'm not madly in love with. Maurice is worthy of more than this response-- but I have him in high esteem. Daphnis et Chloe-- I know the ending of the ballet gets the most attention, but the opening ten minutes of the ballet floors me. I remember chilling to this on repeat after a 100 mile bike ride on a 90 degree day. Miroirs: I LOVE this-- it ranks with the Debussy Preludes in my book, and some of my favorite solo piano music. Valley of the Bells is amazing, and there is something so hauntingly random about Oiseaux tristes that I can't get it out of my head. Gaspard de la nuit. Strangely enough, the outer movements don't do it for me-- it's insanely complex, and a lot to like, but I've not heard a version that clicked with me. The middle movement (Le Gibet) is completely transcendental-- that insistent drone kills me. I had that on a walkman, and listened to it a few minutes before visiting my first Buddhist temple in Thailand, and now I can't get that piece out of my head when I'm in Asia. ALso, after a VERY stressfull day, I'll turn out the lights and listen to Le Gibet in the dark. Funny, on Bolero I went from liking it, to hating and scorning it, to loving it. You just need to remember what he said-- it's 17 minutes of orchestration, not music. There is a Zen thing to it. Piano Concerto for the Left Hand is one of my favorite PC's period. So heavy and brooding. I must admit his other one leaves me cold. But the Left Hand PC knocks me dead. I really like Mother Goose-- both for two pianos and orchestrated. I have a version for two pianos and percussion that also has Rhapsodie Espangol I really like a lot-- although I can't seem to remember the label it was on. I like the String Quartet in F Major- and I'm not big on String Quartets. "If it sounds good, it is good." When does Ravel's music arrive at maturity? Sometime around the turn of the century? It's a rather small output in general, but as Luke says nothing duff (like all my favourite composers!). 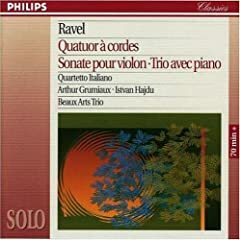 I would really like to get a very complete view of Ravel - having loved the piano trio, violin/cello sonata, the few piano works that I own and the two concertos for a long time, and now being introduced by Luke to the Mallarme set and the Madagascan set of songs makes me want to explore all the rest. The later violin sonata, Tzigane, and other songs, and complete piano music, seems the obvious place to turn. Haven't even heard of L'enfant et les sortileges or Histoires naturelles.
. . . Haven't even heard of L'enfant et les sortileges or Histoires naturelles. Histoires I can understand, but L'enfant? One of the major operas of the 20th century? 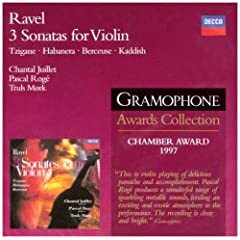 Remedy the situation immediately - you're missing an experience you will dig deeply And whilst you're at it, get hold of Ravel's other one-acter, the superb L'heure espagnole. It's top quality Ravel, no less a piece than L'enfant but only a little less 'out there' in conception. I'd recommend Ansermet for both operas. Good taste has made me steer clear of the Previn recordings with the horrible Disney-animation style covers. Histoires naturelles, FWIW, are much smaller works - a song cycle setting texts about birds and small animals. The fisherman recounts his evening encounter with a kingfisher in crystalline wonder, the peacock struts proudly to the dots of a French overture etc., etc. The poems and Ravel's settings, are mildly revolutionary (the songs did in fact cause a bit of a stir) because of the colloquial language and, in the case of the music, in the equally colloquial ellisions which Ravel asks for. 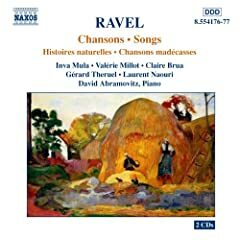 But above all, this is mature, complex, confident, skilled, funny-touching Ravel at his best. Suggestions, dare I say it, befitting a . . . genius. Ordered the Naxos Ravel songs set, and the Chiu piano recording... Ansermet's recordings of the operas seem to be very expensive so I think a trip to the Pendlebury is in order!